Generation Star Wars' John Hood and Taking The Short View's Andrew Lewin take their customary look back over the latest series of Doctor Who. Then, just as we were thinking of putting pen to paper (or fingertips to keyboard and touchscreen), the news broke that Steven Moffat is to step down as showrunner after the next series and the torch is to be passed on to Broadchurch creator Chris Chibnall - himself a man with impeccable Doctor Who fan credentials who has contributed several stories to the show over the years, and also to Torchwood which he co-produced for the first two series. Does the confirmation of his impending departure colour our perspective of Moffat's fifth complete series in charge of our favourite show? Will we get misty-eyed and sentimental about the Grand Moff's achievements now that the end is in sight? You'll have to read on and see, as we embark on a particularly timey-wimey trip through the highs and lows of series 9. Christmas special 2014: "Last Christmas"
Andrew: We didn't get to include the 2014 Christmas special in our series 8 deliberations. As we obviously wouldn't want to miss it out entirely, and since the episode will be included in the forthcoming Complete Series 9 DVD and Blu-ray box set, it seems like this is the ideal point at which to start our latest ruminations. That said, "Last Christmas" does feel a very long time ago - can you even remember that far back, John? Or do you need me to do an impromptu Wham! rendition to help? John: The thought of kissing Soufflé Girl under the mistletoe serenaded by George Michael… Oh, wait. I sure can, Andrew! Primarily due to speculation Jenna Coleman was leaving and I wasn't ready to say goodbye to Clara - in spite of the naysayers. Andrew: And now we know that Clara really was meant to leave in that episode, except that Jenna changed her mind and Moffat had to rewrite the scripts at very short notice. And very glad we were about it, too. In retrospect this was a rather odd story for a Christmas special, even allowing for the fact that Moffat managed to crowbar none other than Father Christmas himself into it. Tonally it was very dark - the whole base-under-siege thing and the gruesome face huggers meant it really did wear its science fiction influences (The Thing, Alien) very much on its sleeve and indeed even spelled them out on screen toward the end. Significantly all except Inception that is, which was arguably the biggest influence of all in terms of the story's structure. What with that very bittersweet scene with Danny and then the apparent passing of Clara from old age at the end amid talk of "eventually one Christmas has to be the last Christmas", it really was all rather downbeat and melancholic for Christmas Day. Then again, I suppose no more so than that jet black festive perennial It's A Wonderful Life! John: Yes, it was a curious confection. Using Father Christmas as a means to deconstruct Doctor Who, as a fictional hero was clever, but setting such a heartfelt exploration against an edgier sci-fi tale was misguided. "A Christmas Carol" and "The Snowmen" were far more successful festive flings. However, I wept with joy when Clara accepted the Doctor's poignant invite to stay aboard the TARDIS and was left elated in the knowledge the duo would further develop their compelling relationship in series 9. Episodes 1 & 2: "The Magician's Apprentice" and "The Witch's Familiar"
Andrew: So now we're officially off and running on series 9. How long did it take before you knew who the little boy was in the pre-title sequence? Andrew: Wait, what, not real?! Say it ain't so! Next you'll try telling me that Father Christmas doesn't exist either. John: Really should stop sharing spoilers! So, were you as enamoured with this encounter between the Doctor and Davros, Julian Bleach reprising a role he masterfully took charge of in "The Stolen Earth", a series on from when I'd hoped Capaldi and Bleach would meet? Andrew: Yes, I very much remember how convinced you were that Davros would be in series 8 - turns out that you were right, just a little quick on the trigger! I too immediately recognised the mist-shrouded world and the mix of old and hi-tech military technologies, and from there instantly jumped to the assumption that the little boy would be Davros. That said, I was still genuinely caught out by the return of Julian Bleach to the role as I hadn't even heard any rumours about that happening - was I being particularly obtuse in that regard, or was it a genuinely well-kept secret? John: No, it was a surprise to me too. Andrew: Unfortunately the fact that I had so quickly jumped to the realisation that it was Davros - and moreover that the episode was going to tackle the classic question from "Genesis" about whether you'd kill an innocent child to stop the evil he will do as an adult - rather blunted the success of "The Magician's Apprentice" for me. It was stuffed full of fan-pleasing vignettes (brief visits to Karn and UNIT; the Doctor's arrival on a tank; Clara and Missy walking in space) but disappointingly little of real substance. John: The return to Karn was self-indulgent, but I savoured it nonetheless. Andrew: Enjoyable self-indulgence is about right overall. But then came "The Witch's Familiar" which added all the meat and protein that I felt had been missing from the first part. The scenes between the Doctor and Davros were absolutely crackling with drama and energy - both of them such phenomenal performers - and the two-hander between Clara and Missy was almost as good. Michelle Gomez really is terrific as Missy, isn't she? The whole thing demonstrated what you can do with a two-parter format with some ambition and imagination, which doesn't involve merely running up and down an increasing number of corridors and getting captured, escaping and captured again like in the old serials. The only thing that gave me pause for concern about the otherwise excellent story was the way that the Daleks were essentially undone by backed-up drains. In what had been a really serious, high-brow drama up to this point, the sudden tidal wave of effluent came perilously close to being overly juvenile and silly - more execrable than excrement, you could say. John: The final act almost imploded into pantomime farce amidst the overflowing pipes - where's Nintendo's mascot Mario when you need him? However, did you notice the nod to Star Wars? Davros' request to see Skaro's sun, with his own eyes, echoed Darth Vader's dying plea to Luke Skywalker in Return of the Jedi. The despot elicited tears before his deception and endgame was revealed. Andrew: I leave the Star Wars allusions to the expert! But yes, it was really amazing quite how that combination of Moffat's writing (some of his all-time best, I thought) and Bleach's superlative performance elevated one of the show's all-time favourite 'boo-hiss' monsters into a relatable, fully-rounded person for the first time - while still also fully in keeping with the character's past history within the series. Episodes 3 & 4: "Under the Lake" and "Before the Flood"
John: The base-under-siege premise promised a classic yarn of Patrick Troughton-era pedigree and "Under the Lake" delivered despite my hope the Sea Devils would make a surprise return, to rejoin their Silurian cousins in the current run, never materialising. The claustrophobia owes much to Aliens with a healthy dose of The Haunting. "Before the Flood" was spectacularly let down by the overhyped Fisher King, voiced by Peter Serafinowicz who is perhaps best known as the voice of Darth Maul in the first Star Wars prequel The Phantom Menace. The monster worked wonderfully in the shadows until it was exposed to the harsh light of day and looked, well, clumsy and not in the least bit threatening. Have the producers never seen Alien? I'm being rhetorical. The tension was heightened by the news Jenna was leaving the series and Clara's departure could come at any moment. What did you make of this ghoulish caper, Andrew? Andrew: Like you, I love claustrophobic base-under-siege stories (although I have to admit, a few of them do go a long way and they can easily be overdone.) I also love haunted house/ghost stories, so "Under the Lake" totally floated my boat (bad pun intended) and I thought the first episode was really rather terrific; and what a cliffhanger on which to end on as well, with the spectral Doctor floating past the window! I'm really mystified as to why after such an impressive first part, the second went so badly awry. The McGuffin business with the mobile phone was particularly irksome, but more damagingly some of the 'explanations' (such as what the aforementioned ghostly Doctor was all about) just made no sense at all, whereas others felt too obvious and pedestrian. It meant that it became a bit of a slog to get to the end. And sadly, I have to agree that the Big Bad himself was really very poor. Sure, the silhouette of the Fisher King towering over the Doctor in the crypt was neat, but he never actually did anything - the nature of his threat is left to descriptions being told to us (by Paul Kaye or all people) but the threat is never for a minute actually up there on the screen. The scenes where the Fisher King goes trudging around the Cold War village in the open made him look less of a danger than a tired old age pensioner coming back from the shops with too much shopping to cope with. John: An hilarious, if unfortunate, analogy. Andrew: Sorry, I really wasn't even trying to be particularly funny - that's genuinely how those scenes felt to me. That said, I thought that "Under the Lake"/"Before the Flood" as a whole showed the strength of the two-parter format: the original set-up in the first episode was so strong and the ensemble of characters so interesting - especially Cass and her interpreter Lunn - that overall I still rated the complete story pretty highly despite the narrative collapse toward the end. I'd forgotten that the news about Jenna's departure came at this time. She did seem oddly sidelined for much of this story, watching the Doctor 'perform' for most of the first episode and then rather overshadowed by Cass in the second. Episode 5: "The Girl Who Died"
Andrew: Now we come to potentially our first major disagreement in this retrospective! Which it turns out is nothing to do with the merits of an episode but rather whether or not we're going to consider the next story as either a two-parter or as two connected but separate stories. I'm going to nail my colours to the mast and opt firmly for the latter because the two stories are so completely different in every respect - other than the recurring appearance of Maisie Williams in both. John: Ha! Blame my OCD and the broadsheets. But, as our readers are about to discover and possibly yourself, Andrew, I bailed on the following episode for no obvious reason other than a bizarre habit of never watching every episode of Doctor Who since its return in 2005! However, my seemingly inconsistent fandom is not what's at stake here. Anyway, back to "The Girl Who Died" - what did you make of Ashildr? John: Much was made of the excellent Maisie Williams' debut in Doctor Who in the wake of her deserved success in Game of Thrones. Could she be playing Susan, the Doctor's granddaughter last seen in “The Five Doctors”, or Romana regenerated? It turned out to be neither and this was an anticlimax, but didn't detract from an entertaining romp that riffed on audiences' expectations of Maisie's role in Game of Thrones albeit with a Viking twist. Seeing Ashildr trapped in an endless life, as those around her died, echoed the Doctor's existence and it was a chilling finale to an episode that is tonally a reprise of last year's "Robot of Sherwood", which I loved and you loathed. Andrew: You're absolutely right. I came into "The Girl Who Died" rather dreading it, totally expecting it to be this season's "Robot of Sherwood," and there were indeed a lot of similarities. But actually I found it quite fun and enjoyed this one in exactly the way I didn't take to "Robot" last year. It was light and humorous and had some terrific moments - the hilarious 'training montage' for example, or the lovely way the Doctor defies the odds once again by using the power of storytelling as his secret weapon. But even so this felt a very slight and slender story, one I would have difficulty even remembering if not for the ten minute coda where the Doctor makes his fateful decision to bring Ashildr back from the dead. Up until then her character would barely have been noticed in the background if played by anyone other than Maisie Williams, but the casting certainly raised expectations - probably a little too high for its own good, actually. It did feel to me somewhat as though the introduction of Ashildr in this episode - something that was necessary for later in the series - may have been retroactively bolted onto a story that didn't quite have enough material to it in its own right. You can almost see the join - where historical hijinks give away to big moral dilemma - and I'm not sure that the end result really came together all that well. Episode 6: "The Woman Who Lived"
Andrew: And since you've already tipped your hand that you didn't get to see "The Woman Who Lived" at the time, I guess this one's up to me to mind the gap! This is an episode that makes little secret of the fact that the story (about Lenny the Lion's rather uninspiring machinations, and Rufus Hound's clowning around at the gallows) is almost entirely secondary to a study of Ashildr's (or Lady Me as she's now called) progress through the centuries. In many ways the idea of the ageless immortal having to stand by and watch as everyone they love withers and dies is an overly familiar trope by now - we've seen it in Doctor Who with the Doctor and with Captain Jack, in other shows like Highlander, and in just about any film starring vampires as romantic figures. Certainly a lot of fans at the time complained this was going over well-trodden old ground. But while there was certainly some overlap I think they managed to find an interesting new take: the fact that Me is trapped in the body of a young girl during what was a horrifyingly misogynistic period of world history means that unlike Captain Jack she can't simply swagger her way through as the quintessential alpha male. She has to be more inventive. And unlike the Doctor she can't just skip the boring bits in a time machine, either: she has to grind her way through every single miserable moment. As far as I can see, the most original part of Lady Me's story is the way she has now outlived her own capacity to remember, and has to write everything down which in turn means she can then selectively edit which journals she keeps and re-reads, and which get discarded. There's something really fascinating and powerful in that concept, and it's well played by a maturing Williams. That said, for me at least neither part of "The Girl Who Died"/"The Woman Who Lived" was strong enough to raise the other half up in the way that "Under The Lake" kept "Before the Flood" from going under. Neither story was bad by any means, but at the same time the brace of stories felt distinctly average and were probably the most noticeable dip in series 9. John: It does appear the episodes were more filler than thriller! Andrew: Yes, I'm not really sure you missed out on anything. Even Clara sat this one out! But did you have any sense of a gap in terms of Ashildr/Me's character arc when she came back in "Face The Raven"? Episodes 7 & 8: "The Zygon Invasion" and "The Zygon Inversion"
This was probably Jenna Coleman's best showcase of the season - first playing something 'not quite right' about Clara, followed by going full evil as her own Zygon doppelgänger, and then playing both participant and observer in the final showdown. And what a phenomenal scene that was for Peter Capaldi as he lectured both Kate Stewart and Zygon-Clara about the consequences of what they were about to do: you're right, one of the greatest anti-war speeches ever delivered. I was convinced that scene would stand for all time as the definitive Capaldi-as-Doctor moment to be henceforth used in clip shows down the ages, but of course I wasn't to know that something even bigger awaited us just a few weeks down the line. John: Going back to our open admissions of not watching every single episode of Doctor Who during our lifetimes. Tom Baker's era marked my formative years as a Whovian and "Terror of the Zygons" was, political subtext aside, the stuff of childhood nightmares replete with some of the best cliffhangers in the series' distinguished history. The image of a Zygon attacking Sarah Jane Smith, at the end of episode one, scarred my fragile child psyche. So, I was hoping for something that would harken back to those nightmarish Saturday teatimes invaded by shapeshifting aliens. And the two-parter delivered in spades, executed with a guile evoking classic sci-fi cinema of the 1950s. We were thrown into McCarthy-era America, a world preoccupied with the enemy within. Reds under the bed or in this case monsters under the bed in a body horror tale worthy of directors John Carpenter or David Cronenberg. Then there was a captive Clara channelling my most beloved TARDIS companion of all, Sarah Jane Smith, whilst her Zygon doppelgänger Bonnie went in deadly pursuit of the Doctor. This would have been the highpoint of any other series, and Osgood's return - replete with multicoloured scarf in homage to the Fourth Doctor, my Doctor - was most welcome and I sincerely hope we'll see the scientist again. Was Osgood a human or a Zygon? It’s moot as she’s brilliant and now Zygon Bonnie’s an Osgood too. Double the fun. Episode 9: "Sleep No More"
John: Mixed feelings about this episode, with which I struggled. The found footage format of The Blair Witch Project seems stale at this point and the Big Bad evoked Oogie Boogie from Tim Burton's The Nightmare Before Christmas! I couldn't help laughing, but perhaps not for the reasons writer Mark Gatiss, a writer who shares my penchant for the gothic, may have intended. I fear the Wachowskis' The Matrix may have hijacked Morpheus, the god of dreams, as every time he was mentioned I pictured Laurence Fishburne. Andrew: Very much the love-it-or-loathe-it Marmite episode of the year, this one - as we're kind of coming to expect from Gatiss, who does tend to polarise the fans with his contributions. Initially I was rather nonplussed by this story as well, but a strange thing happened when I sat down to write my full-length review for Taking The Short View the following day. The more I thought about it and analysed what Gatiss had done with this story, the more impressed I became. Yes, it was confusing and disorganised and lacked a 'proper' ending - but that's because Gatiss was very effectively evoking the genuine sensation of being stuck inside a nightmare that makes no sense. He also does a lot of very subtle but nonetheless powerful 38th century 'world building' around the margins, and presents some intriguing concepts and interesting characters. It's only toward the end when he tries to gild the lily with one too many extra layers that the thing starts to topple over, but even then he leaves us with one of the most powerful images of the entire year - the sight of Reece Shearsmith's Rassmussen disintegrating before our eyes. I didn't suffer from the same Oogie Boogie (or even Matrix) associations to mar the main monster, and even the found footage conceit - which I confess I'd been dreading - ended up working surprisingly well for me. It meant that when the Doctor or Clara turned round and talked direct to camera it really did feel as if we were right there in the middle of the adventure right alongside them. I thought director Justin Molotnikov in particular did a fantastic job making this one work, and there was some fabulously creepy sound design going on, too. As the one completely standalone episode of series 9, I wonder if this one might gain popularity because it's the easiest one for people to re-watch from the box set in the future? On the other hand, it’s that very sense of being isolated and dropped into the middle of the run as an afterthought which makes it feel rather disconnected. And I also think it suffered from the fact that in the last few months we'd already had one story about dreams ("Last Christmas") and two creepy base-under-siege stories with rapidly dwindling supporting casts ("Last Christmas" again, and "Under the Lake"/"Before the Flood".) While I did say earlier how much I liked base-under-siege stories, I also added that 'a few of them do go a long way and they can easily be overdone' and this is perfect proof of the principle of diminishing returns. In fact unless I miss my guess, the set of the Le Verrier Space Station itself was a redress of the undersea base from earlier in the season - which really brings home how much of a do-over in different found footage clothing "Sleep No More" truly was. John: The episode isn't without merit, with a few genuine scares along the way. Episode 10: "Face the Raven"
Andrew: Okay, the moment has come - and we're not remotely prepared for it. We knew that we'd be bidding farewell to Clara at some point in the series, but this was still a very hard and bitter pill to swallow. How did you cope with it, John? John: As badly as expected, Andrew! Never one for fateful goodbyes or being robbed of the opportunity. I entered the episode filled with dread, and the Hogwarts-inspired adventure delivered and then some. I found myself choked up and in tears during the final act - almost unable or unwilling to watch and listen to what was unfolding. It was akin to losing a loved one, with no means of stopping the inevitable, and stirred memories of Adric's death in classic serial "Earthshock". Admittedly, Adric was a companion I was neither interested or invested in, but suddenly he was going to die and there was nothing the Doctor, Nyssa and Tegan could do. As in life, there can be terrible consequences. Andrew: I seem to be the only Doctor Who fan who was ever remotely fond of Adric! I guess it was because he was a mathematician like me. In Adric's case he got into trouble merely trying to show off how clever he was and to prove he was right: as ways of getting yourself killed that's not really a particularly noble way to go. By contrast Clara's exit was really quite something. It all came down to her self-confidence that she's now almost an equal in every respect to the Doctor himself and therefore utterly believing in her (and their) ability to outsmart all dangers in the nick of time, hence she has no qualms about somewhat glibly putting herself in harm's way in order to save new father Rigsy. When it does finally start to sink in for Clara that there's not going to be a happy ending this time, Coleman's performance turns astoundingly powerful and affecting. Her mantra "Let me be brave" as she walks to her fate will surely tear the heart out of anyone watching, and also particularly the moments prior to that when she thinks through the consequences of the terrible things the Doctor might do next in retribution and tries to talk him down while there is still time. John: Capaldi and Coleman delivered an acting tour de force in a lyrical fairytale, the former suggesting a deep darkness and flaws in our time-travelling hero that had first been explored during Christopher Eccleston's tenure. It wasn't difficult to envisage a grief-stricken Doctor declaring war against the universe and becoming the Big Bad himself, something alluded to by Davros in "Journey's End". Ultimately, the companion, Clara, would save the Doctor from himself, and in an act of redemption bravely come to the fore amidst her own hubris which had begun in "The Snowmen". Andrew: That's Moffat for you, always playing the longest of long games! But I was interested about something you said right at the start there - about having come into the episode filled with dread. Why was that? Was it because of the sudden deluge of spoilers in the preceding days (including a most uncharacteristic slip by Capaldi himself on a chat show leading up to the broadcast)? I still wonder whether those 'slips' were in fact intentional and carefully orchestrated: without the heavy sense of approaching doom that they lend the episode, I'm not sure that the rest of the storyline is all that strong or even interesting. However, being gripped by the fear that this really is it for Clara - and hoping desperately that we're wrong - is pretty much the main driving force behind this story, one that we wouldn't have had without the advance spoiler 'slips'. What do you reckon, is it a valid conspiracy theory? John: An interesting conjecture, to paraphrase Davros in "Genesis of the Daleks". Inevitably, Capaldi's apparent 'slip' was all over social media and that's where I discovered it. Certainly, the spectre of that comment and the trailer with Clara's clarion cry "Let me be brave" haunted the episode. There was a lot of speculation surrounding Ashildr/Lady Me replacing Clara as the next companion. Did you buy into that, Andrew? Personally, I assumed Maisie's Game of Thrones recording schedule would preclude adventures aboard the TARDIS. Andrew: No, I'm absolutely in agreement with you - there was no doubt in my mind that HBO have her firmly under contract until the end of Game of Thrones and that there would be no chance of her joining Doctor Who full-time. And by this point the idea had even been firmly squelched in-show as well: there's a scene in "The Woman Who Lived" in which Ashildr/Lady Me directly asks the Doctor to take her with him in the TARDIS and he flatly refuses, explaining that he relies on his companion's ephemeral humanity to keep him connected with what's important and that the idea of two detached, callous immortals travelling together would be a recipe for disaster. All that said, who would you like as the next companion? With Clara having been a very similar sort of Moffat-esque archetype to Amy Pond (and in the longer view sense, not unlike Rose and Martha before them) I do think we now need a bit of a change to prevent it becoming too formulaic. That's why Catherine Tate's year as Donna Noble was so brilliantly refreshing, and why having Rory around as well made a big difference in series 6. Someone like Alex Kingston would have been ideal, although at the same time the character of River Song itself has rather run its course now. Whatever he does, I hope Moffat creates a real character this time rather than just a plot outline ("the girl who waited", "the impossible girl") before leaving the actress to fill in the blanks - as Jenna Coleman admittedly did so brilliantly with Clara. John: I still think Clara's story arc was originally intended to be resolved during Matt Smith's tenure and that Matt and Jenna would both leave the series together. This in no way detracts from my enjoyment of series 8 and 9 as evidenced by these prose. You know, I'm skewing more towards a companion-less Doctor, at least for a few episodes! I'm reminded of how brilliant Matt was in "A Christmas Carol" whilst briefly separated from Amy and Rory. Andrew: Ahh, but there he effectively picked up a young Kazran as a stand-in companion so he was never really 'alone' at all. I tend to think a companion is a necessary part of the show, but I remain to be persuaded otherwise. And if they can't think of something new to do with the role then maybe you're right. John: An astute observation regarding young Kazran, Andrew. Perhaps companion-of-the-week could be a thing? Andrew: I know this is the penultimate episode and not the season finale, but for me at least we have arrived at the pinnacle of series 9. Even two and a half months after first seeing it, I find it hard to know what to say about "Heaven Sent". It's like being asked to criticise the Mona Lisa: you can find all manner of faults if you look closely enough, but who really wants to hear a mean-spirited nitpicking attack on a masterpiece? And 'masterpiece' is exactly what I think we need to admit this episode is. John: And Capaldi carries this masterpiece in what is a thematic reprise of "The Mind Robber", and more so "The Deadly Assassin" where the Fourth Doctor leaves a companion behind - and not just any companion, but dear Sarah Jane in the previous serial "The Hand of Fear" before returning to Gallifrey. Only this time the companion is dead and the Doctor is heartbroken, lost in a psychological hell and using an imaginary Clara as a sounding board. At any point did you think we were back in the Death Zone on Gallifrey, Andrew? Andrew: No, I have to say that idea didn't occur to me at all. It just never felt like part of the Gallifrey set-up to me, not with that castle and all that water. But I didn't have any other ideas about where it was either, and it never occurred to me that it was within the confession dial or what the twist was going to be. I should have - I usually do get these things very easily - but I was either very slow that day or else Moffat's sleight-of-hand was particularly effective on this occasion. Andrew: As far as previous episodes that this felt like a reprise of, the one that came to my mind was series 8's "Listen." The unseen menace in that one (the figure under the blanket) was effectively the same personification of dread and death as the Veil here - albeit this one has added scary hands! Both "Listen" and "Heaven Sent" felt to me to be very influenced by the psychological terror of MR James' Christmas ghost stories and in particular Oh, Whistle, And I'll Come To You, My Lad and its two TV dramatisations: the classic 1968 one by Jonathan Miller featuring Michael Hordern, and the updated 2010 adaptation written by Luther and indeed Doctor Who scribe Neil Cross and starring none other than the War Doctor himself, Sir John Hurt. If you haven't seen them, do check them out on DVD. John: You had me at John Hurt. Thanks for the suggestion, I will give that a look. Plus, there's further Big Finish audio tales of The War Doctor to savour. Not that I’ve heard any of Big Finish’s Doctor Who adventures. Too much information? Andrew: I’m trying very hard to resist the temptation of getting those new Big Finish adventures for now to be honest. For all the talk about prior art I have to say that when it comes down to it, "Heaven Sent" is unlike anything else I've ever seen. It astounds me that Doctor Who actually managed to sneak what in essence is an experimental one-man avant-garde stage show into the BBC One Saturday evening prime time schedule. Moffat really sets himself up to take a massive fall here because he's essentially loudly proclaiming 'Genius At Work' and daring people to take pot shots at him for hubris. And instead he totally delivers and gets away with it, because - despite all the critics busy sharpening their knives - that's what this genuinely turns out to be: an unsurpassed work of television drama at its absolute finest. I think even Dennis Potter will be applauding this one from the TV lounge of the afterlife. I honestly think Moffat knew when he wrote this that he was going to be leaving the show soon. In fact I'd wager that he wrote it when he thought this might even be his very last series in charge as showrunner, and he just wanted to go out with something dazzling. It’s a calling card that he will be able to use for the rest of his career: 'Whatever else I did in my life, I wrote "Heaven Sent" and no one can take that away from me.' Of course his confidence in even attempting this hugely ambitious project was doubtless shored up by the knowledge that he was writing for Peter Capaldi, who is able to nail everything in the script and more besides. I'm convinced that guy could read the phone book and still make it sound as compelling as anything written by W. Shakespeare! Okay. Have I gushed enough? I need to catch my breath. You take it, John! John: Blimey - or jeepers, as my late Canadian grandmother was fond of exclaiming! I'm virtually at a loss as to how to follow that, but needs must. We're at our journey's end for series 9. An emotional roller coaster with one more timey-wimey twist up the Grand Moff's sleeve. Were you prepared to see Clara, seemingly alive, or was it a twist too far, Andrew? 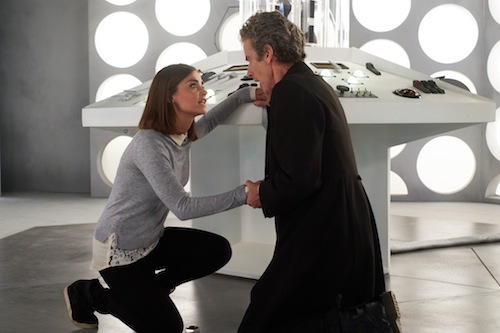 Andrew: I had no doubts at all that Clara would be back for "Hell Bent". After three years of penning Clara’s adventures with the Doctor, there was no way on earth that Moffat was going to leave her final appearance in the hands of anyone else - now even as good a writer as Sarah Dollard, who did such a fine job with those climactic emotional scenes in "Face the Raven." I'd have been utterly shocked if it turned out Moffat hadn't appointed himself to write Clara's final moments. The only question was how exactly he was going to do it. Maybe go in search of one of Clara's 'Impossible Girl' multiple personas? That's what the initial scenes in the diner felt like. But it was just the first of Moffat's many teasing feints before he finally revealed what he was up to. John: The diner reveal elicited fond memories of series 6 premiere "The Impossible Astronaut", an episode we both lauded on social media at the time of its original broadcast, and I was delighted to be back in such familiar surrounds. The enigmatic setup with an amnesiac Doctor sitting at the bar talking to waitress Clara reminded me of director David Lynch's seminal water-cooler series Twin Peaks, and I was hooked on this finale that begins with a blockbusting flourish as the cloister bells ominously ring on Gallifrey and deftly zeroes in on a deeply personal tale between the Doctor and Clara. In essence "Face the Raven", "Heaven Sent" and "Hell Bent" are a trilogy dealing with loss, grief and moving on. Did I adore this tragic trifecta? Hell yeah! Andrew: Looks like we're both waxing lyrical now! And I think you're spot on identifying how this season finale manages to be both epic (the long-awaited return to Gallifrey and the overthrow of Rassilon) and quietly intimate (the moments in the diner and in the TARDIS at the end of time) which successfully pick up and resolve all the storylines and threads that have been woven through the series up to this point. We are indeed finally home, having come the very long way around indeed. That said, I actually didn’t think "Hell Bent" was quite as successful as it perhaps should have been. Partly that's because Moffat is never inclined to go for the populist, crowd-pleasing celebratory climax that his predecessor Russell T Davies was always so good at: for example, the confrontation with Rassilon comes down to quietly drawing a literal line in the sand and then waiting. Once that's done then what follows is essentially a string of discussions and arguments in a succession of different rooms. Moffat even seems to realise that he's low on the action quota because he throws in brief cameos from Daleks, Cybermen and Weeping Angels to try spicing things up, and then introduces the cool-looking Cloister Wraiths - but it's evident that his heart isn't in any of that and it's almost like he's bored with the Wraiths the minute they appear, because they contribute absolutely nothing except some set dressing. Instead of a cathartic release, this finale - like many of Moffat's big season-ending stories and several Christmas specials - lacks the resounding feeling of out-and-out fun and joie de vivre that the audience has earned by this stage and which Davies would have dutifully provided, and Moffat’s more cerebral approach risks leaves everyone slightly frustrated and possibly dissatisfied by going for the less-obvious instead. The 50th anniversary story "The Day of the Doctor" was one of the few times when he's actually comprehensively nailed it, and by comparison that same sense of fulfilment remains tantalisingly just out of our reach here. Perhaps the biggest problem with "Hell Bent" is the sheer quantity of series continuity that it relies upon. There's barely a single scene that doesn't call on something from the series' past: that's fair enough in terms of using things from series 9, but in fact you also have to be clued up in detail about the whole of the last ten years since the reboot in 2005, particularly when it comes to the tangled tale of Gallifrey, the Time War and Rassilon. But it's not only that - the final scenes with the Doctor and Clara rely heavily on you remembering the fate of the Doctor-Donna, for example, and there's even a fateful four knocks on the TARDIS door just like the portent of doom for David Tennant's Doctor. It's all used without explanation which means a lot of it goes at best right over the heads of the less-well informed, but at worst it becomes confusing and exclusionary. In fact the call-backs stretch back deep into the classic series as well, and the whole thing becomes a little too introspective for comfort for anyone other than the true Whovian cognoscenti. In many ways this finale seems like it was one of the stories that Moffat originally intended to have in Matt Smith's unrealised fourth season which has instead had to be held over until now, which makes it a couple of years too late. The inward-looking approach was fine and understandable for the 50th anniversary year, but we really should have moved on from it by now. Unfortunately Moffat doesn't seem able to resist paddling around in the Doctor's past and it has become something of a fatal flaw in his approach and in the current incarnation of the show, one that I fear is increasingly getting in the way of its popular appeal. This feels like I'm ending on a bit of a downer, and I don't mean to. Even with these reservations I still rate "Hell Bent" as a strong four-star episode. It's just that I came away from this thinking that real change is needed; and since I've hoped time and again that Moffat himself would be up to delivering that change only to have such hopes quickly dashed, I have now reluctantly arrived at the conclusion that it's only ever going to happen once there's a new hand at the helm. And of course, six weeks after "Hell Bent" aired came news that Moffat is indeed standing down, although he'll get one final valedictory series before Chris Chibnall takes up the reins. But whatever now happens in series 10 and beyond, let's be happy: after all, Moffat will forever be the person who wrote "Heaven Sent." And "Blink" too! Andrew: Oh, I entirely agree. That recreation of the TARDIS Type 40 interior took my breath away. If you asked me what my favourite single scene in the entire series was this year, it would be the moments we get to spend inside that old-new console room. Sublime, exquisitely executed and totally unexpected - and an example of where 'continuity' doesn't also have to mean being inaccessible to those who lack our 50-year-plus recollection capability. John: Prior to Christmas I treated myself to a new television. A Samsung Curved SUHD 4K 3D LED TV. One of the first things I viewed was "Hell Bent" and the Type 40 console room grew ever more beguiling. Christmas special 2015: "The Husbands of River Song"
Andrew: And so we end up where we started, with our second Christmas special of this retrospective - this time from 2015. It's a rather different proposition from the dark and nightmarish one we opened our retrospective with from 12 months earlier, I think that it's fair to say, John? John: Unequivocally. This so-called comedic romp (or should that be romcom?) was patchy, and nothing gelled together for me. Disinterested, I opened up Facebook on my iPad until the Doctor said "Hello, Sweetie!" to River (Alex Kingston). The final scenes were bittersweet and memories of the wonderful "Silence in the Library" came flooding back. That's all I have to say on this so-so special. Andrew: I totally get that Christmas specials are different from other stories, and are intended for a specific purpose: to entertain the hyperactive kids on Christmas Day while the adults slump into a temporary food coma. In that sense "The Husbands of River Song" was without doubt a far better choice of story for the festive occasion than the sombre and disturbing "Last Christmas". However, knowing and accepting that still doesn't mean that I personally have to like it, and the simple fact is that I really didn't like the majority of this episode. Moffat might be a genius but he's no Douglas Adams, and a lot of this outing seemed to be consciously trying to riff off of The Hitchhiker's Guide to the Galaxy and falling short by quite a margin. I actually fell asleep watching it - I've never done that with a new Who before. John: You fell asleep during Doctor Who! ‘Twas the season of food comas, but that’s no excuse. Andrew: I know, shameful isn’t it? I did get through it the following day, mainly by filtering out all the cartoon capers and just concentrating on the Doctor/River rapport which was every bit as much of a treat as you'd expect from pairing Capaldi with Kingston. That said, it still felt like hard work for just ten minutes of reward. Once again the two storylines felt like an odd mix: the broad humour of Hydroflax, Greg Davies and Matt Lucas for the kids, then a sudden switch to focus on the very grown-up, mature adult relationship between the Doctor and River. Many of the younger viewers watching might well not even have known who River was, as it had been three and a half years since the character was last properly in the show - that's a lifetime! Not to mention that River's timeline is so twisty-turny in the first place that it really does take a big flow chart to keep track, so much so that even some long-time professional Who commentators failed to realise that what the Christmas special was doing was using a few lines of dialogue from 2008's "Forest of the Dead" to construct an elegant 'trap' which means that this has to be her last-ever appearance in the TV series. Still, I'm glad she did get the opportunity to take a decent final bow - it would have been terrible if River's last on-screen appearance had remained that preternaturally calm AI apparition in "The Name of the Doctor." Andrew: So, time to sum up. After you, John! John: Series 9 has built on the divisive series 8 with spectacular results for the most part. From war-torn Skaro to a homecoming on Gallifrey, I've been riveted by this more introspective and ambitious series; even with the spectre of series continuity and the 50th celebration in 2013. Highlights include “The Magician’s Apprentice”/“The Witch’s Familiar", "Under the Lake", “The Zygon Invasion”/“The Zygon Inversion”, "Hell Bent", "Face the Raven" and the majestic "Heaven Sent". I could take or leave "Before the Flood", "The Girl Who Died" and the weakest link was "Sleep No More", which I'm unlikely to ever revisit. The dubious honour of most risible story goes to "The Husbands of River Song". As an aside. I'm reminded of not seeing "In the Forest of the Night" from series 8 - blame the DC Universe (DCU) for that! Ultimately, the heartbreaking hybrid reveal in “Hell Bent” was a masterstroke. Much better than a generic Dalek/Time Lord creation, which is more the province of a school playground. So, not at all shabby and one of the best runs since series 5. I'm going to miss Clara, but will always treasure her time aboard the TARDIS. Jenna Coleman emerged from the narrative nightmare of the Impossible Girl in series 7 to create a companion to rival the best of them. Andrew: It seems we're remarkably aligned on all fronts this year. I think it's pretty clear that my standout favourite of series 9 was the remarkable and extraordinary "Heaven Sent," but it was a very strong year. I'd also include "The Witch's Familiar" among my favourites despite the problem with the drains at the end; the gripping "Under the Flood" despite the fact that the second episode couldn't rise up to the same level; and of course the remarkably provocative Zygon two-parter which said so many important things with such impressive style, conviction and passion. Heck, for all my ill-tempered carping about it, I still rate "Hell Bent" as one of the best stories of 2015 - but then, I'm obviously exactly the sort of die hard Whovian cognoscenti the episode was intended for in the first place. I don't think there was a really weak moment in the entire series, actually. While "The Girl Who Died" and "The Woman Who Lived" were probably the thinnest stories, I still enjoyed them and I can't bring myself to cite them as being 'least favourites' because they were absolutely fine: standard, middle-of-the-road Doctor Who episodes with much to commend them. I guess many people would join you in considering "Sleep No More" to be the least of this year’s weekly stories but I'm among the converted on that one, and I'm actually relieved not to have to hand my wooden spoon nomination to Mark Gatiss again for a second year running. But I do agree with you that ultimately the worst of all 14 instalments we've been looking at here has to be the most recent - "The Husbands of River Song". If I have to consciously ignore two-thirds of an episode in order to get just a little vestigial pleasure from the final scenes between the Doctor and River then clearly something has gone badly awry as far as I'm concerned. John: One final question from me to you, Andrew. With the news our good Doctor is off the air until Christmas, do you think DC's Legends of Tomorrow can fill a timey-wimey gap in the schedules? Andrew: To be honest, I'm a little worried that the recent rate of expansion of the DC Universe is spreading things too far, too fast and too thin, not to mention that with all the Marvel shows and films as well it's all getting just too overwhelming. However, I do wish it the best of luck and will certainly give it a try. And you have to say that Rory Williams (Arthur Darvill) has certainly had the right training and workplace internship to step up and become a Time Master - I'm assuming that's one rank above a Time Agent but still one below a Time Lord, right? And that's a wrap for our retrospective of Doctor Who series 9. And unfortunately it's going to be a long wait before we get to do this again, as it has been confirmed that series 10 - Moffat's last at the helm - won't now air until the spring of 2017. But rest assured: assuming we're both still standing by then, we'll be back to cast our eager eyes over it the minute the final credits roll! Doctor Who Complete Series 9 (which includes four audio commentaries, prequels and prologues, deleted scenes, trailers, episodes of Doctor Who Extra and six short behind-the-scenes documentaries) will be released on DVD and Blu-ray on March 7, 2016. You can already buy the Christmas specials as stand-alone releases, and the 12 episodes of series 9 itself have been released in two parts albeit with a reduced set of extras.